Queens Park Rangers have been advised not to select midfielder Sandro for Sunday's Premier League game against Manchester City because of an issue with his UK residency visa. The Brazilian, 26, played the full 90 minutes of Rangers' last match, a 2-1 defeat at Liverpool on 2 May. But he will sit out Sunday's game at Etihad Stadium, which Rangers need to win to avoid relegation. 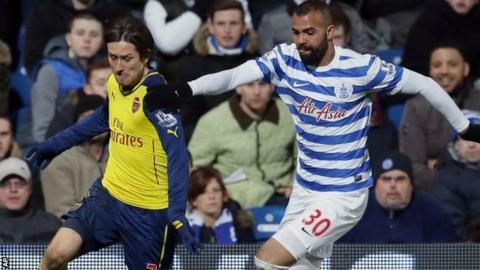 A QPR statement said: "The club are working to resolve the issue." The west London side are nine points from safety with three games to play - against City, at home to Newcastle and away at Leicester. In their statement, Rangers added: "In response to an article which was published by the Sunday Mirror, the club can confirm it was informed by the Home Office on Thursday, 7 May that there is an issue with Sandro's UK residency visa." Sandro joined Rangers from Tottenham in September 2014, having spent more than four years at White Hart Lane.